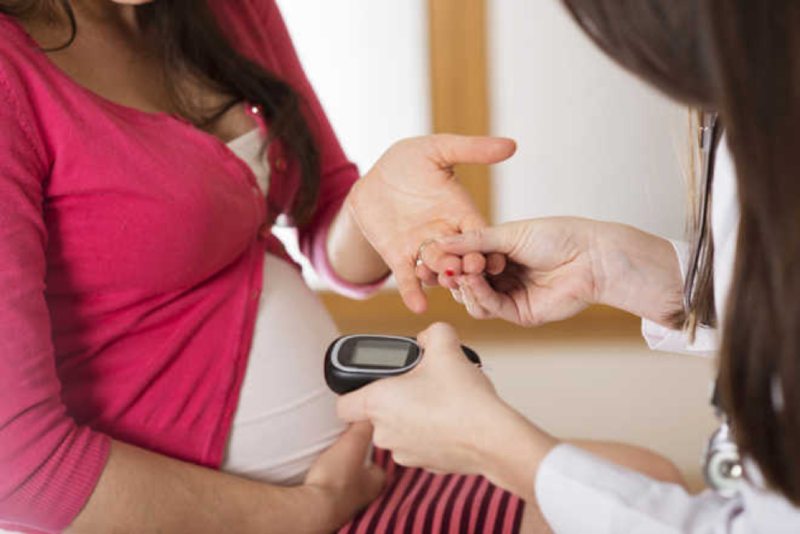 High blood sugar or gestational diabetes occurs in 9.2% of women who are pregnant. It is also called temporary diabetes and it occurs when the blood glucose levels in the mother increases beyond normal limits. High blood sugar can lead to complications for both the mother and the baby. You can control your blood sugar levels during pregnancy by making lifestyle changes, exercising and by consuming medications recommended by your doctor. Controlling your blood sugar levels is essential for a safe and healthy pregnancy. The hormones produced by the placenta such as growth hormones, cortisol, estrogen and progesterone, human placental lactogen, placental insulinase blocks the action of insulin in your body. As insulin is needed for the metabolism of carbohydrates, blocking its action leads to high blood sugar levels during pregnancy. The imbalance between hormones that increase blood sugar and the hormones that decrease blood sugar can lead to high blood sugar levels. Furthermore, during pregnancy you may tend to eat more and exercise less which can also contribute to insulin resistance. If you are obese or overweight you have a higher risk of developing gestational diabetes. It has been found that women who have a BMI of 30 while they conceive have a higher risk of developing gestational diabetes. The increased fat in your body can make you more prone to insulin resistance. You have a higher risk of developing high blood sugar if you get pregnant when you are 35 years or older. If you are prediabetic when you got pregnant you are more prone to gestational diabetes. If you have a family member suffering from type 2 diabetes then you are more at risk of developing gestational diabetes. You are also more at risk if you have had gestational diabetes during your earlier pregnancies. If you have had a stillborn baby in your previous pregnancy then you can develop high blood sugar during the subsequent pregnancies. A condition like polycystic ovarian syndrome also increases your risk of gestational diabetes. You also have a higher probability of developing gestational diabetes if you are an African, Asian, American Indian, Hispanic or Pacific Islander. If you have been advised by your doctor to be on bed rest then it can increase your chances of developing gestational diabetes. Bed rest makes you more prone to gain weight which can cause insulin resistance and increase in blood sugar. Gestational diabetes generally does not show any obvious symptoms. Increased thirst and increased urination may appear as symptoms in some women. All pregnant women are usually screened between 24 and 28th week of their pregnancy to check if they have gestational diabetes. If your doctor suspects that you have gestational diabetes they may recommend the ‘glucose challenge test’. You may be asked to take a sweet beverage and after an hour your blood sugar levels will be checked. If your blood sugar levels are more than 130 -140 mg/dL then they may recommend further tests to confirm the diagnosis. They may recommend the 3 hour ‘glucose tolerance test’. Before this test you will be advised to fast for 8-12 hours. On the day of the test, your fasting blood sugar levels will be tested. Then you will be asked to drink a sweet beverage. You blood sugar levels will be tested after 1, 2 and 3 hours. If two or more blood sugar readings values taken during the test are higher than normal you will be diagnosed of gestational diabetes. The values for the test are: fasting blood sugar higher than 95 mg/dL, blood sugar readings at 1 hour – higher than 180 mg/dL, 2hour – higher than 155 mg/dL, 3hour – higher than 140 mg/dL. Blood sugar can cross the placenta and reach the pancreas of your baby. This can make the pancreas of your baby to secrete more insulin. Increased insulin can increase the size of your baby at birth which is a condition called macrosmia. Babies that weigh 9 pounds or more can experience complications during delivery and can also lead to a C- section. Gestational diabetes increases your risk of delivering a premature baby. Premature babies are more prone to respiratory distress syndrome, a condition in which the baby cannot breathe on their own and need external respiratory support until their lungs develop and become strong. Further, babies born to mothers with gestational diabetes are prone to respiratory distress syndrome even if they are not born before the normal due date. If you have gestational diabetes your fetus may produce elevated levels of insulin which can lead to hypoglycemia in your baby at birth. Hypoglycemia in new born babies can cause seizures. This can be treated by immediately feeding your baby or by administering intra venous glucose to your baby after they are born. If you have gestational diabetes your baby is more prone to develop type 2 diabetes later in life. Gestational diabetes can increase your risk of miscarriage and delivering a still born baby. If you have high blood sugar you are more prone to develop high blood pressure and preeclampsia which can lead to life threatening complications. You are diagnosed with preeclampsia if you have hypertension and presence of protein in your urine after 20 weeks of pregnancy. If you suffer from gestational diabetes you are at a higher risk of developing diabetes type 2 later in your life. If you have been diagnosed with gestational diabetes you will be required to visit your doctor more often during your pregnancy. Your doctor will carefully monitor your blood sugar levels and will also recommend medications to control your blood sugar levels. Do not skip your appointments with your doctor or skip your medications. Your doctor may also recommend you to visit a dietician who will monitor your diet. If you have gestational diabetes your doctor may recommend that you monitor your blood sugar levels several times a day. Follow the instructions given by your doctor and monitor your blood sugar levels frequently. Eat a healthy and well balanced diet with lots of fruits and vegetables. However, eat fruits according to the recommendations of your dietician. Avoid consuming sugars and simple carbohydrates. Avoid fat rich foods and foods containing saturated fats. Consume foods containing polyunsaturated fats. Opt for canola oil, olive oil, unsalted nuts, avocados etc. Add lots of proteins to your diet. Include lean meat, eggs, fat free dairy and skinless chicken in your diet. Include lots of whole grain containing foods such as whole bread. Avoid soda, sports drinks, juice, smoothies, etc. Avoid starchy vegetables such as potatoes, cakes and cookies. Do not eat fast foods and processed foods during your pregnancy. A sedentary life style can contribute to gestational diabetes. Start an exercise regime that is safe for your pregnancy after consulting with your doctor. You can also opt for simple walking and stretching exercises which will effectively control your blood sugar. Control your stress levels by performing meditation, listening to music and socializing with your friends. Reducing your stress will also help you maintain a healthy pregnancy.